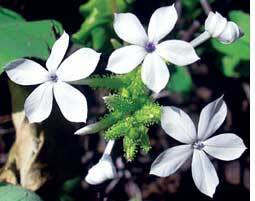 roots of the herb Chitrak (Plumbago zeylanica) may help cure lung cancer. A complex yellow pigment, plumbagin, found in the root cells of the herb, has been found to check proliferation of cancer cells and induce their death by disrupting the cellular structure, says a study. During recent studies on mice, the pigment was found to inhibit the proliferation of human intestinal, cervical and even ovarian cancer cells. Such intriguing results encouraged the joint research team from the Calcutta University and Bose Institute, Kolkata, to pursue its effects on human lung cancer cells. The findings of the study were published in the July 29 issue of Biochemistry. For the study, the researchers first cultured a special type of human lung cancer cells (A549) and exposed them to varying concentrations of the pigment in solution. The pigment stifled the growth of cancer cells. "When exposed to increased concentration of Plumbagin, the cells shrank in size," said lead researcher Gopal Chakrabarti from the Dr B C Guha Centre for Genetic Engineering and Biotechnology of Calcutta University. In the next step, the researchers found out how the pigment initiates the changes in cellular structure. For this, they exposed plumbagin to a protein called tubulin, isolated from goat brain tissue. Tubulin forms structures called microtubules, networks of which make up the skeleton of the cell. Plumbagin binds directly to tubulin, inhibiting its formation into microtubules, thus contributing to the collapse. Tuhin K Biswas of J B Roy State Ayurvedic Medical College and Hospital, Kolkata, says, "The yellow pigment has been in use in traditional medicine. It is used as an anti-oxidant and as a gastric stimulant for treating loss of appetite. The discovery of its anti-cancer effects open up new avenues."